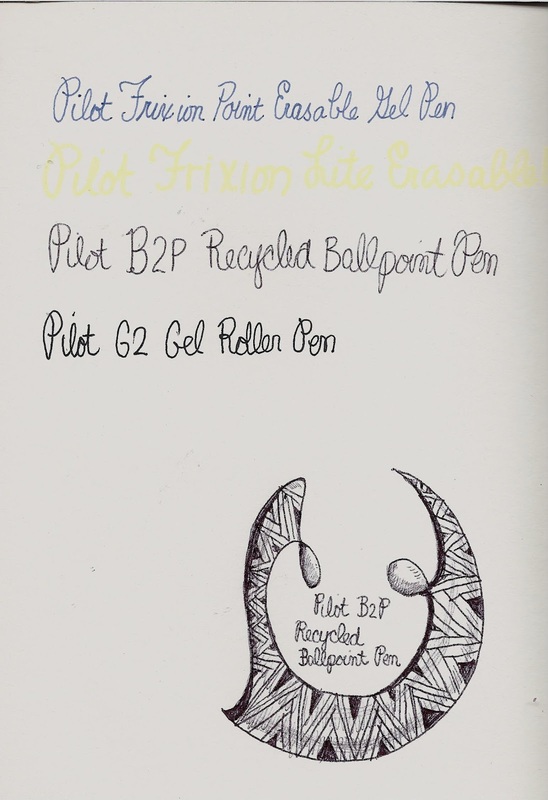 I received a cool package from Shoplet this week-a set of Pilot Be Green Dry Erase Markers w/refill, a Pilot FriXion Lite Erasable Highlighter, a Pilot FriXion Erasable Gel Pen, a Pilot B2P Recycled Ballpoint Pen, and a Pilot G2 Gel Roller Ball Pen. (For some reason, I didn’t include the highlighter in this photo. I think it was hiding from me). The BeGreen Dry Erase Marker is made with 91% recycled content and has a refillable ink supply and chisel tip. It’s a fat little thing, lol, but even though I have small hands, it was comfortable to use. 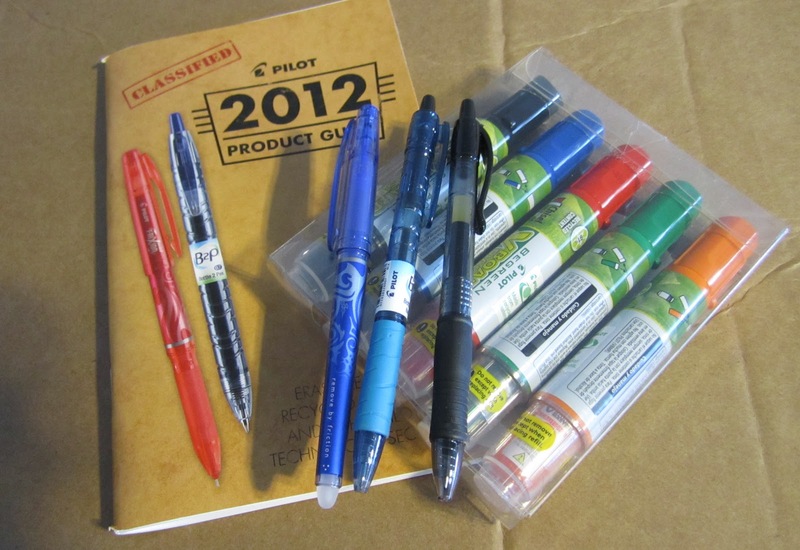 The 5 pack I received has orange, red, blue, green and black markers, plus I received a red ink refill. I was a bit concerned at first. I don’t use a dry erase board, and I can’t think of why I might need one. But that’s what the internet is for, isn’t it? I looked up uses for dry erase markers, and it turns out that they’ll write on mirrors, metal cabinets, plastic freezer containers (mark what’s in the container and just wipe it clean after you’ve used it-cool!). But I don’t have any of those items that I want to write on. However…. 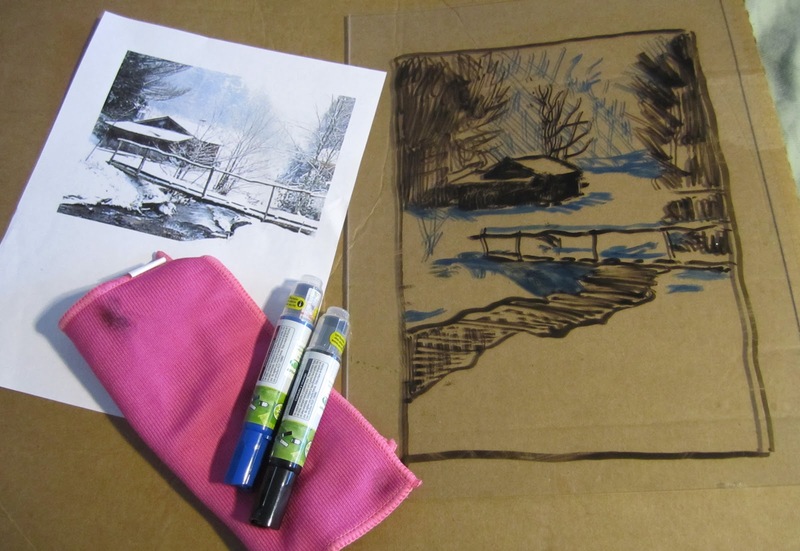 I was working on landscape drawing and needed to make a rectangular drawing from a square reference photo. This is normally a pain in the patoot, because you have to draw and if you don’t like it, you erase it, and … well, long to short, I have this nice piece of acrylic that I use as both base and palette when painting. It struck me that I could use my dry erase markers on this acrylic to simplify the trial and error. Really cool! I put my reference photo under the acrylic and drew each element wherever I wanted. It was super easy to wipe off what I didn’t like. Then I moved the photo again to try something different. One of the reasons I don’t like doing realism is this step. But the dry erase markers make it so easy! After I had all the elements, I used this sketch as a reference to draw something more permanent, and then wiped the acrylic clean. This is exciting! What a wonderful way to work out the rough layout and values quickly without using up sheets of paper that would just get tossed. I can’t really compare these dry erase markers to others because I’ve never used them. I don’t believe they have much of an odor, but right now I don’t have much sense of smell (allergies). The ink flowed easily, and didn’t skip or smear. It wiped off easily with a cloth, but didn’t come off accidently when I was drawing. And the ‘more permanent’ layout sketch I did? I used the Pilot G2, Pilot B2P, and Pilot FriXion Erasable to draw it. This sketch was done to establish lights and darks and basic areas of color. (Sorry–the finished piece is for a magazine advertisement, so I won’t be showing it here). The FriXion gave me the areas I wanted to be dominated by blue, the G2 gave me my darkest areas, and the B2P gave me the lighter strokes to establish where I wanted a broken foliage look or tumbling water. 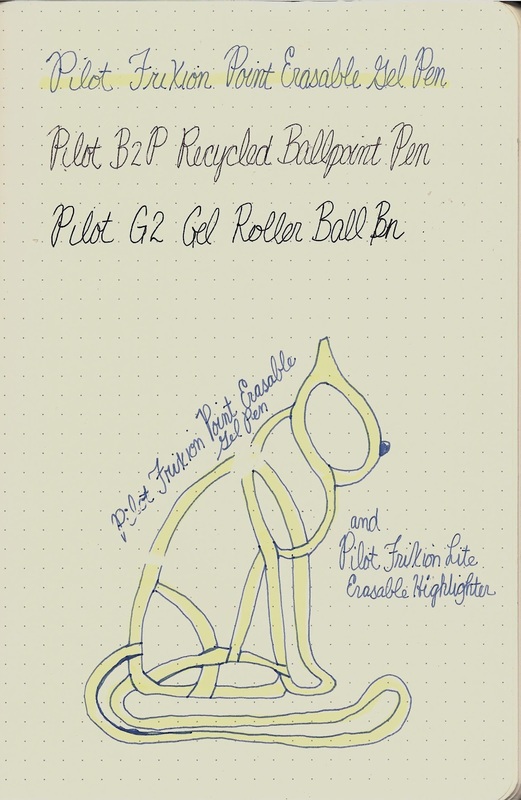 The Pilot G2 Retractable Gel Ink Roller Balls are refillable click pens with a fine 0.7 mm tip. They have a clear body that lets you see how much ink is left, and a contoured rubber grip for comfort. That’s still a thicker point then I like for my smaller drawings, but it’s fantastic for something like the layout sketch I did above. This is a pen I’ll prefer for writing over drawing, though. The ink is dark and gives a nice bold line. Like most gel inks, it gives a consistent width and solid stroke. But I like to vary my line widths most of the time and the darkness of the stroke. The G2 will be great when I want a stark contrast of black and white. In the writing comparison I did here you can see that the G2 has the darkest ink of the three pens. The B2P’s are refillable click pens with a medium 1 mm tip. I’ve bought these pens in the past because I like the fact that they are recycled from plastic bottles, and I like the look and the feel of them in my hand. While the pens don’t skip, I do find the ink coverage isn’t always even, and I have had these pens come apart in my purse (not the only pens to do so though-my purse is a wild and woolly place!). I like these for drawing more than I like them for writing. You can get dark values but it requires layers to get complete coverage. On the other hand, you can easily get very light values and I find that more important with my style (mileage will definitely vary). For drawing purposes, the G2 and the B2P work well together. 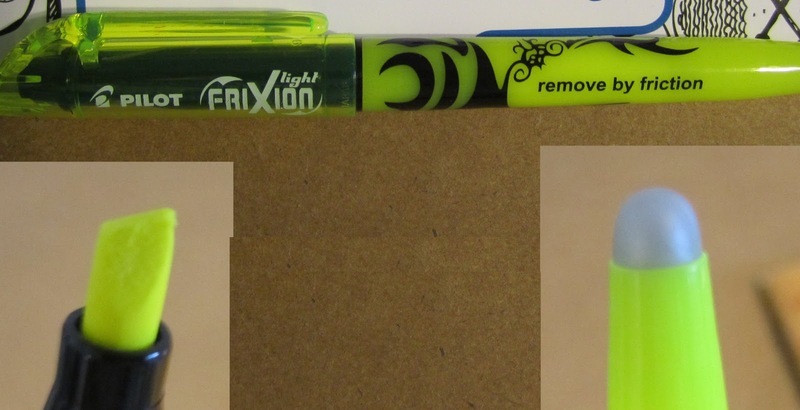 The FriXion Erasable Gel pen is non-refillable with a needle point 0.5 mm tip and cap. It’s a stick pen with a cap (non-clickable) and a hard rubber tip eraser on the other end. I’m pretty excited about these pens (and had already bought some of them in different colors). I like the feel of them. I like the point size and the needle tip. It would be nice if they were made of recycled materials though. What really separates this pen from the herd is that it is erasable. If you look at the doodle below, you’ll see white spots at the shoulder and lower down the back where I’ve erased both pen and highlighter (more about the highlighter below). 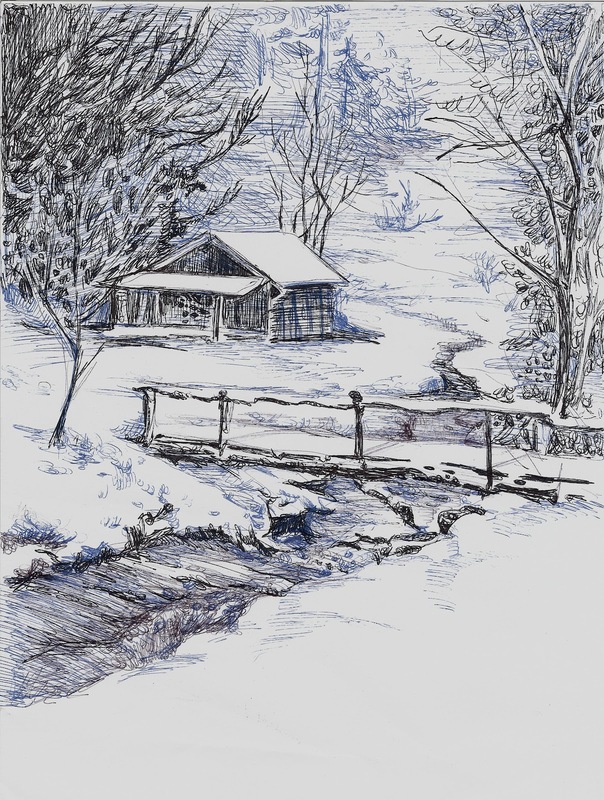 I’ve used the pen on several types of paper, and it erases cleanly on all of them. It takes a little pressure because you are erasing by friction. I was curious so I took a cheap white rubber eraser and tried it and it erased the ink. Then I just rubbed briskly with my fingertip. I wasn’t able to erase, but I did reduce the color a bit. Accidental erasure shouldn’t be a problem unless you write on a desk pad or a surface that has a lot of movement of heavy objects over your writing. I had to rub pretty hard to make any difference (but no ink came off on my fingers). The spirit of curiosity was still strong within me, lol, so I did some scribbling with a pencil, and tried erasing it with the FriXion eraser. It worked. Kinda. Sorta. About as well as most pencil erasers, which means it smeared and left streaks. Better stick to using it on the FriXion ink! This is my favorite out of all the pens I received, giving me a nice balance between values, but also a good, crisp line for writing. I wish I’d received black ink instead of blue, just so it would be easier for you to see how it compares to the other two. I like the fact that it’s erasable. I do have some concerns about fading, but only time will tell me how that goes. If you saw a book highlighted with The FriXion Lite Erasable Highlighter you wouldn’t think much about it. The ink is the usual neon yellow color. The highlighter is shaped like a pen with a bright yellow body, and while the black blaze is pretty snazzy, there isn’t anything exceptional to separate it from all the other highlighters out there. But like the FriXion gel pen, this highlighter is erasable. As you saw in the doodle above, the highlighter erases completely on good quality paper, but I wondered how it would work with printed ink on cheaper paper, so I grabbed a great big book with thin newsprint type paper and gave it the erase test. As you can see, there is the potential for some ink smearing and paper destruction. The yellow didn’t smear–it’s the cheap ink in the book. There was some pilling and I had to hold the page tight to keep it from crumpling. I like the erasable option, but I’d test it out in a book before trying to erase very much. Thank you Shoplet, and Pilot for these cool pens! And Remember Shoplet can fill all your Office Supplies needs! Previous Post: Viva Las Vegastamps! Giveaway! New Plates for order! Stamps based off my artwork! Thank you! You can see the finished landscape at my Flickr site–http://www.flickr.com/photos/aceo/7976647416/in/photostream. You have to wait for the next RubberStampMadness magazine to see it with stamped images though.